If it was up to my second born, who on his eighth birthday earlier this year proclaimed his undying love for Mexican food, we would have tacos every night. A moderately picky eater, he has always been good about trying everything but just not following through with it. So he would (reluctantly) try a new curry recipe or a quinoa salad, but never eat more than half of what was on his plate. Until he was about six years old and I made tacos one night. It was Tuesday and I announced that Tuesdays would be henceforth called Taco Tuesday. He loved that. It got him all excited. By the time we sat down at the dinner table, he had figured out that we were making and rolling our own tacos at the table. He literally went nuts. For the first time in many years, he finished what was on his plate and came back for seconds. And finished those too. See, I always suspected that his tummy wasn’t as small as he led me to believe. And I also figured out that he loved my house spice combination for all things Mexican: cumin, smoked paprika, oregano, garlic, lime and a dash of caramelised balsamic vinegar. So started a new tradition: Taco Tuesday. We started with chicken and graduated to fish. We mixed it up with Nacho Night where we heaped a Mexican-style slow cooked beef mince onto pure unadulterated corn chips. We also tried enchiladas a couple of times with black beans and charred corn. A home run. Every single time. With the same base set of spices. He would lap everything up and get excited for dinner when he knew it was Mexican food night. Everything. Except the guacamole. I just couldn’t win when it came to avocado with him. He was like an avocado bounty hunter. He knew where to look and also the best possible way to extract it expertly from his plate, whether it was smeared inside a tortilla with a million fillings, or dolloped under a corn chip or two in his nachos. So I decided to think outside the box. I had to appeal to his sense of adventure and also to his palate which was forever craving that special spice combination he had come to love. So one lazy Saturday afternoon when we had just finished a marathon morning of gardening in the backyard and were stretched out on the deck wondering what we could have for lunch, I asked if everyone wanted Mexican and something fun. To unanimous cheers, I went into the kitchen and put to the test an idea that had been germinating in my head for the past week. I was going to make an avocado salad with his favourite flavour combination, one that he wouldn’t be able to resist. 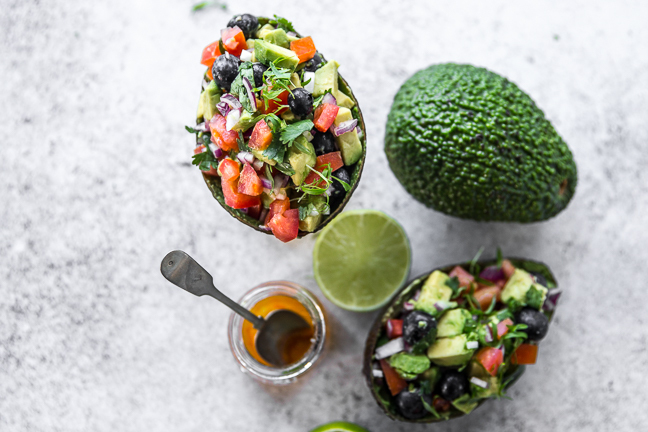 I chopped up a vibrant salsa with avocado, cucumber, tomato, onion, blueberry and mint. I then created a salad dressing with those familiar Mexican spices. 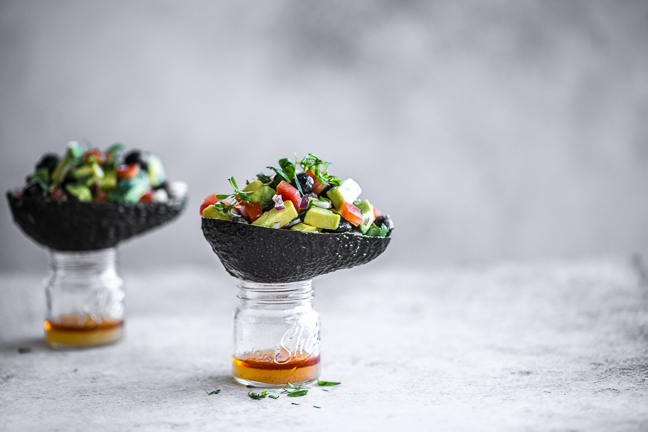 But instead of heaping everything in a big salad bowl, I served the salsa in individual hollowed avocado shells perched precariously on top of single serve shot glasses of the dressing. Served with corn chips on the side to scoop with. The look on his face was classic. Salsa boats that he could dress up himself? What could be better than that? And then he saw the avocado and his face fell. I didn’t push it. I was hoping he would come around, that the novelty of creating his own little salad boat would trump his aversion to avocado. And it did. After two years of trying, we had an avocado victory. Maybe he was just ready for it, or his taste buds had blossomed. Or maybe that flavour combination won in the end. I’ll never know. What I do know is that these days my little boy eats avocado and these salsa boats were the secret weapon in the fleet of my recipes. They are such an amazing canape at parties, all lined up and ready to set sail. Hope you enjoy them too. 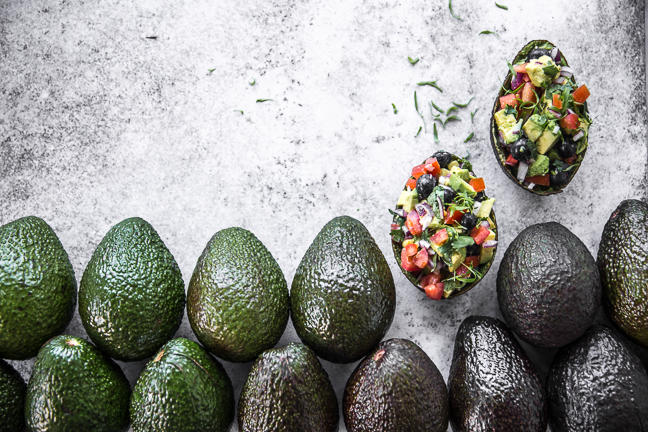 Don’t forget to head on over to Australian Avocados for heaps of avo tips, tricks and recipe ideas. Step 1. Prepare the dressing by placing all ingredients in a mason jar, securing the lid and shaking to mix well. Let the dressing rest while you prepare the salsa. Dressing can also be made the day ahead and stored in the refrigerator until ready to use. Step 2. Score each avocado down the middle, length wise. Gently twist both halves to separate them. Remove the seed by lodging a heavy knife’s blade on the seed and gently twisting the handle. 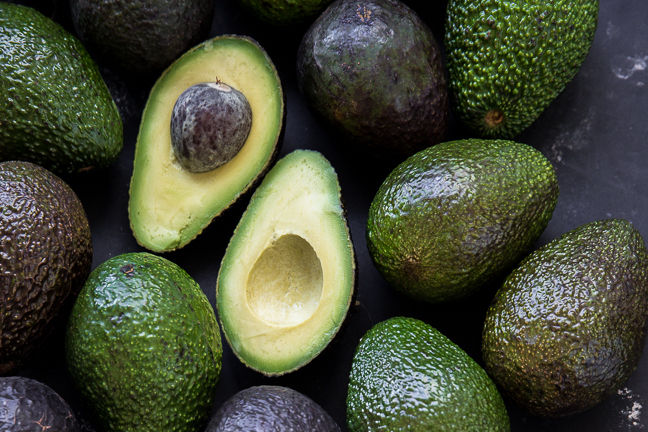 Using a spoon, scoop out the flesh of the avocado from each half, taking care to ensure that the shell is intact. Step 3. Dice the avocado, tomato, onion and cucumber. 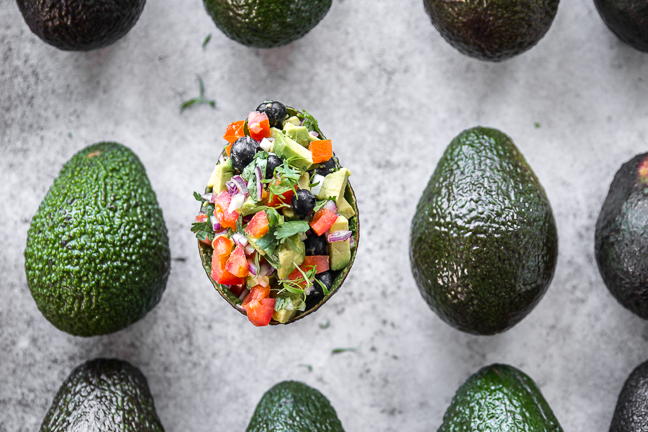 Place in a bowl along with blueberries, mint and coriander. Toss and mix well. Step 4. Scoop the salsa into the four avocado shells. Divide the dressing equally between four shots glasses/jars. Place salsa boats on top of the dressing jars and serve with a side of corn chips. 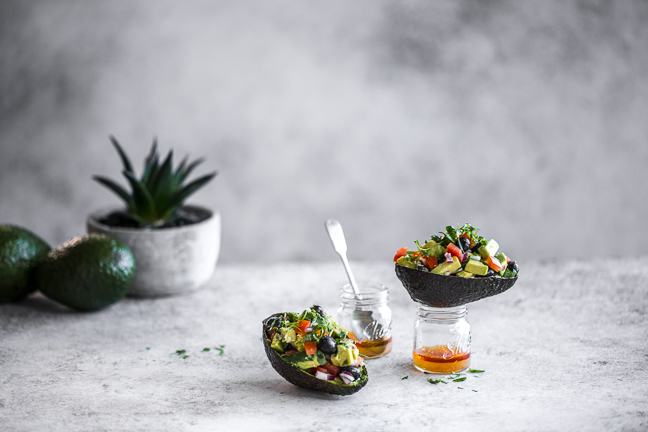 Sneh Roy is a food/lifestyle photographer and stylist based in Sydney, Australia. 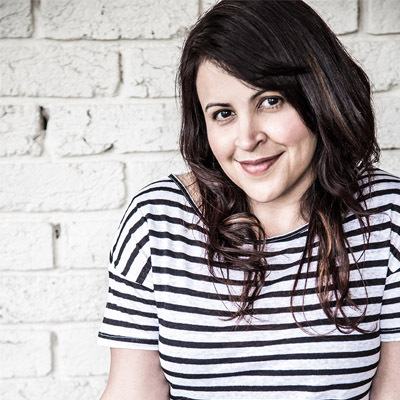 She is the creative force behind the multi-award winning food blog Cook Republic. She is also the author of the Tasty Express cookbook. On her blog and in her cookbook, Sneh creates flavour packed, plant based, nourishing recipes and shares delightful stories about her food adventures with soulful and mouth-watering photography. She also conducts pop up workshops and gatherings to teach food photography and styling from her home studio. Sneh lives in Sydney with her husband, two boys and five chooks. Together (minus the chooks) they explore farmer’s markets, orchards, weekend food festivals and often indulge in slightly messy weekend sessions of sourdough baking, pasta making and curry stirring in the kitchen. Follow Sneh on Instagram and Facebook.